Treat yourself to a fabulous hand stamped vintage spoon with a sweet little message…what a great thing to wake up to next to your coffee! 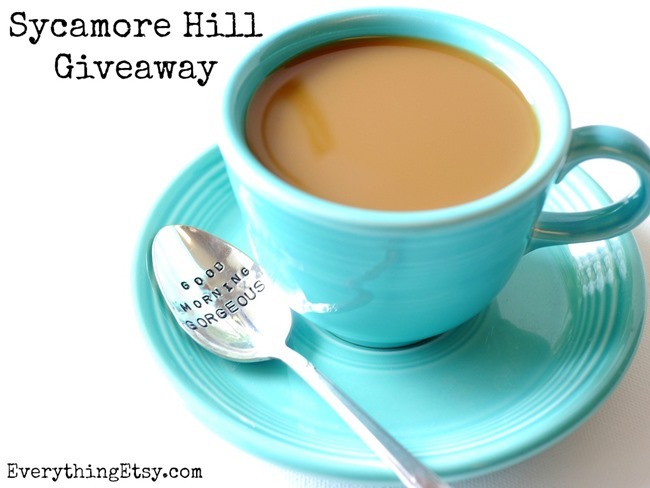 Today I’m sharing some beautiful creations by Sycamore Hill. Each piece is hand stamped by Kelly and shipped right to you wrapped to perfection. I didn’t want to unwrap mine to use it! Kelly Galanos has been stamping away since 2009 and selling them through her Etsy shop. Once she launched The Original Hand Stamped Coffee & Espresso Collection she realized it was going to be a hit! Kelly has been featured countless times, and even shared her vintage spoon creations on The Today Show! 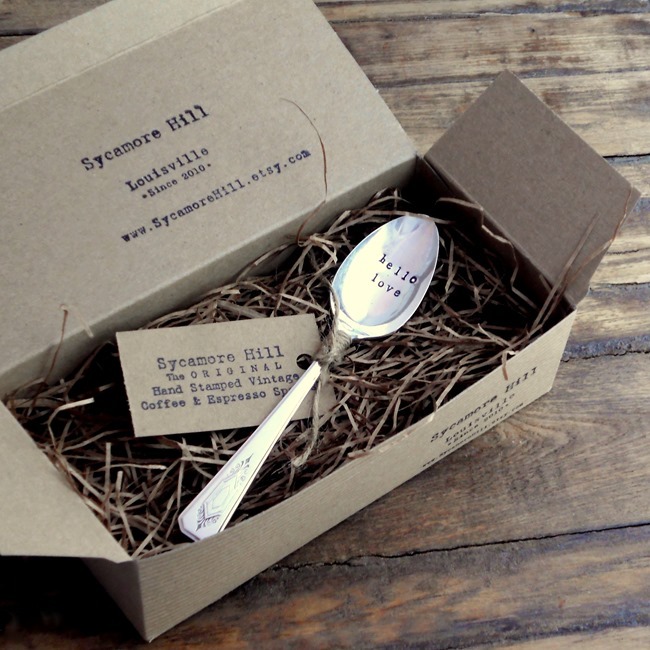 Sycamore Hill spoons make amazing wedding gifts, birthday gifts, thanks for watching my dog gift…you get the idea. 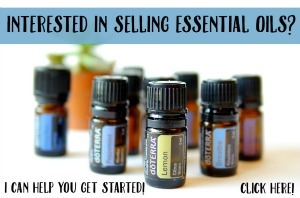 They just make the perfect gift! 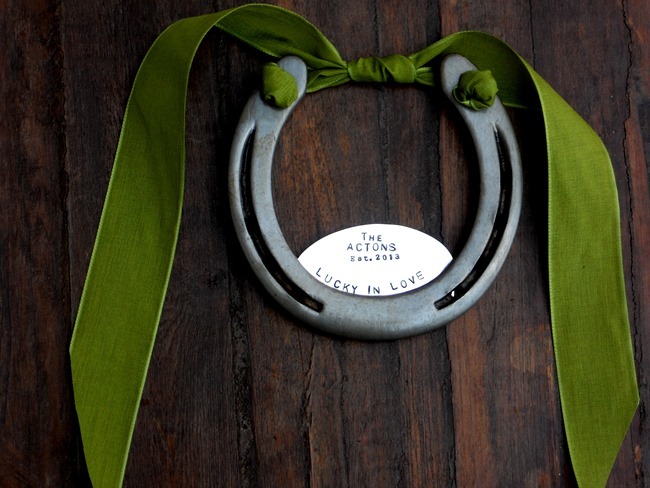 How about a personalized horseshoe? I happen to know someone that would love this! 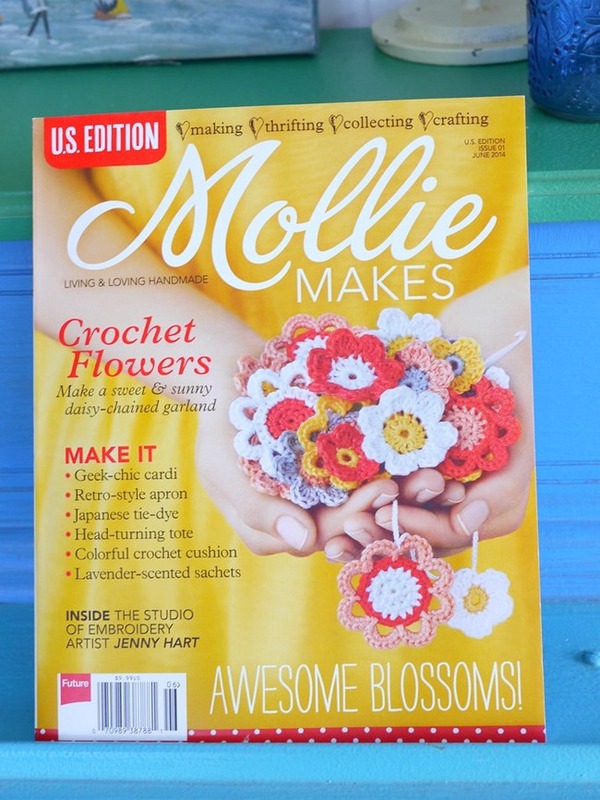 I recently interviewed Kelly for the new Mollie Makes U.S. Edition. She shared a glimpse behind her successful shop. 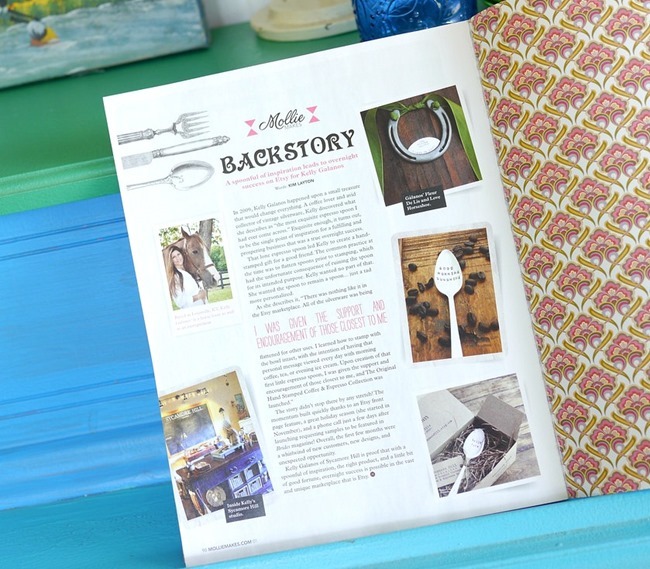 Read her inspiring story in the Backstory of the first issue…June 2014. It can be found at your local bookstore or craft store. She is an inspiration to anyone selling handmade items online. Kelly has been kind enough to offer one Everything Etsy reader two custom spoons of their choice. 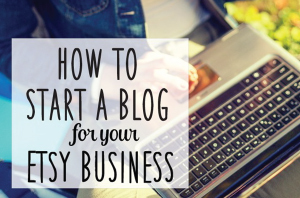 Trust me, you are going to want to enter this!!! Personalize spoons with Bible verses, special dates or cute sayings. This is what handmade shopping is all about…something made with love just for you! Visit Sycamore Hill on Etsy to find a the perfect gift, and keep up with the latest designs and specials on their Facebook page. Enter the giveaway using the widget below. The Vintage Pearl Giveaway — We’re Celebrating! Not sure specifically, but something to inspire my children in the morning to work hard, do their best, have a great day. I am undecided. I love the good morning gorgeous! I also love the idea of Bible verses! I would stamp “Hello Beautiful” on the spoon. Possibilities …. to remind me after I drink my morning coffee that it’s time to look for what the day holds. I would love ” Live aloha every day” and “Let it be” – words to live by! “hello sweetie” (Doctor Who phrase) for my husband. Good Morning Starshine and You Are My Sunshine are my choices. 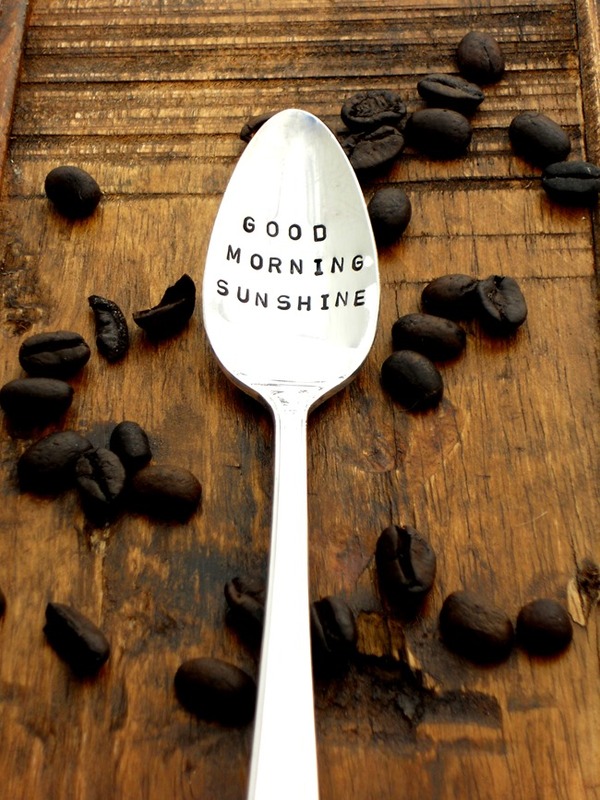 I love the “good morning sunshine”–so cute! It would be so cute to either use the pet names my husband and I call each other most frequently (Cookie and Crumb Cake), or to have them each contain the beginning of Bible verses, “This is the day” and “Rise and shine”. What a fun give away! would love to win! how pretty! I like the phrase “Good Morning Sunshine”. I would like Alice in Wonderland themed spoons with “Why is a Raven like a Writing Desk” and/or “We’re all mad here.” Such a cute gift idea! good morning sunshine! its so adorable. I adore your work! My daughter bought me one of your spoons Christmas 2013 and it was my favorite gift. I used it everyday and then one day I couldn’t find it…I have been heart broken. “LOVE HAS WINGS” or “I LOVE MY MOMMY” or “PAUSE AND BREATHE” or “CHOOSE HOPE…NOT FEAR” or “I ADORE MY FAMILY”! A little bit of coffee and a whole lot of Jesus! I love your website and emails. Thanks for so many inspirational idea. Sunshine and Moonbeam- the nicknames for my 2 oldest girls! I would love to win this. My mom, every morning, without fail makes her coffee and this is when her alone time happens. She NEEDS this, without it, she does not function. With a couple of spoons like this, it would make her morning much more sweeter because, duh, she will think of me because I gave her the spoon, and she will also be reminded about how Jesus wants her! I would have the spoon say something similar to Valerie’s: a whole lotta coffee and a lot more Jesus! I Love Us in honor of our 35th wedding anniversary! Good Morning Sunshine and Hello Gorgeous! Forever friends and morning sunshine. Love the packaging for these spoons – adorable in every way! “you are so cool” – an ode to my amazing husband. It’a line from one of our favorite movies, “True Romance”. I would loveeee some stamped spoons!!! Please google “The Spoon Theory”!!! You could get a lot of chronically Ill Spoonies on board for these!!!!! I would do the following saying: Live, Laugh, Love. God is good =would print this on the spoon. It’s a (made up) word that my husband and I say; it means more than love. For reference, see the book entitled “Love” by Edward Monkton. I would get “I love you” stamped on them!